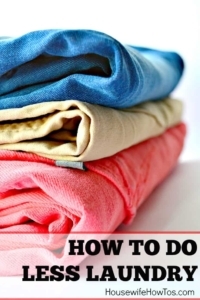 How To Do Less Laundry - Take back your weekends! Ever found yourself staring at a hamper full of dirty clothes and wondering how to do less laundry? Maybe you’re tired of giving up your Saturdays to the tedious process of pre-treating stains, sorting clothes, washing, folding then putting it all away. If so, you’re not alone. The good news is that there is a way to do less laundry. If you’ve got little children, you know their clothes get messy within moments of putting them on. But with older children and adults’ clothes, not everything needs to be washed after each use. Since few people enjoy doing laundry, why not learn how to save time — and money — on this miserable chore? First, an unavoidable fact: doing less laundry means understanding the difference between clothes that are actually dirty and clothes that aren’t. Yes, that means sometimes you’ll wear an item more than once in a row. Before you get grossed out, consider this: electric washers and dryers only became commonplace in American homes in the 1950s. Prior to that, people had much smaller wardrobes and wore their clothes numerous times between laundering. Of course, they didn’t walk around stinking…they simply knew some tricks to keep their clothes fresh. If you’re wondering how to do less laundry, that’s the key: know how often clothes really need to be laundered, and how to freshen them between wearings. Basic guideline: If you sweat in it, you need to wash it after each wearing. This goes for socks and underwear, as well as gym clothes and things worn while working in the garden or yard. Wash outer layers less often. 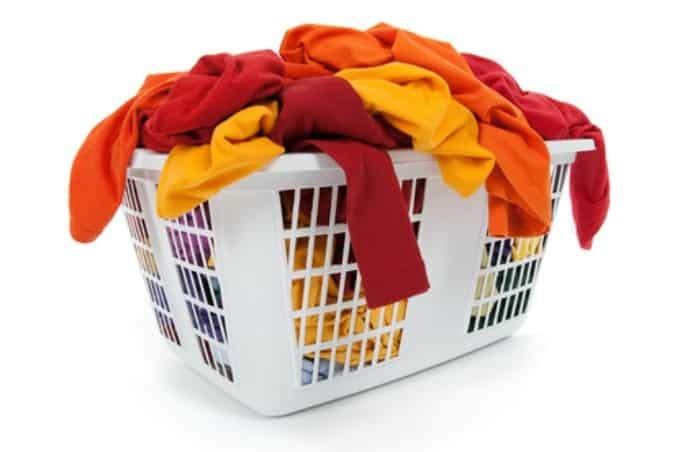 (4-5 uses) Sweaters, hoodies, casual jackets and shirts worn over tees or tank-tops don’t come in direct contact with sweaty skin, so they don’t need laundering after every wear. Give them the sniff test on the pits and check for stains. If they look fine, hang them up to wear again. Women’s blouses and men’s dress shirts: (2 uses) Chances are, you don’t get sweaty at the office. If there are no food stains, hang them and wear a second time. Slacks, chinos and khakis (Pants or shorts): (2 uses) Unless stained, hang them so they’re creased down the front then wear a second time. Bras, slips, girdles and other foundation garments. (3-4 uses)With the exception of sports bras, these don’t need laundering every use. Give them at least 24 hours to air out between wearings. Swimsuits. (Every use) Rinse by hand with clear water and hang to dry after every use to keep sand, chlorine, and salt from degrading the fabric. Dresses, skirts and men’s or women’s business suits. (4-5 uses) Again, you’re not likely to be sweating in these clothes. Air out if they smell stale, and use a clothing brush on heavier fabrics to release any lint or surface dirt. Hang in a steamy bathroom to release wrinkles, or iron as needed. Pajamas: (2-4 uses) You sweat when you’re sleeping, and not just under your arms. We all do. Wash your PJ’s every two wearings, and nightgowns every 3 or 4. Jeans: (4-5 uses, usually) Some folks claim they never, ever wash their jeans. I’m not one of them. If they aren’t stained or smelly, washing every 4 or 5 wearings is fine… unless they’re stretch jeans, in which case they need washing when they start looking baggy. Eliminate musty odors by spraying your closet with an air freshener. Consider stashing a jar of homemade air freshener gel or a few dryer sheets in your closet to add a fresh scent, too. Eliminate smoke odors by hanging clothes over a bathtub. Add 2 cups of white vinegar to the tub, then fill with very hot water. The vinegar steam will rise and neutralize the smoke smell. The vinegar scent disappears as the steam dries. Eliminate wrinkles by hanging clothes in the bathroom while you shower, or spraying with a commercial wrinkle releaser. A quick ironing (even with your hair iron!) works, too. Adopting these tips for how to do less laundry won’t just save money on utilities, your clothes will last longer, too, since they won’t go through the rough washing/drying cycle as often. Who knew doing less laundry could be good for you? That’s a fantastic idea, Leaza! I know this is true, I just can’t bring myself to wear clothes without washing them. I think it’s a personal, psychological issue.